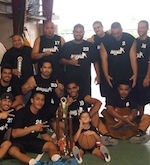 American Samoa came in New Zealand with an unexperienced squad to play the FIBA Oceania Youth Tournament. The team was made of the best players from the country's high-school league, unfortunatly the level played during the week in Auckland was just to high for the samoans. The team ended at the 7th spot with a 1-5 record. Despite its american heritage, American Samoa wasn't like the Dream Team during this tournament. The top Oceania level is nothing to be compare with the local high-school league. Of course, some samoan players are really good but they were dominated by taller and faster opponents. The team was only fielding 8 players for most of the games and the bench depth really was an issue for the coaches. Two players managed to play their usual game, Ata Perese and Vailili Malauulu, and they were rewarded by a spot in the Oceania All-Star Team. Perese was the best samoan during the week and despite being only 188cm tall he was one the best inside player on the court. Thanks to this tournament, the players from AmSam are now more used to the Oceania level and the country's national team should benefit from that experience during the 2007 South-Pacific Games. The travel to these Games would be short, they will be hosted by the near Samoa. The samoans were stuck in the tahitian defense during most of the game and only Ata Perese was able to score without forcing bad shots. AmSam was unable to stop the guamese offense. This game was the only one where the samoan players were the taller on the court, but that wasn't enough. A large loss to close the pool phase against a gifted australian team made of players born in 1990. Ata Perese played only 13 minutes before being fouled out. After the blowing loss to Australia, the samoans suffered another devastating crushing against the host nation en-route to the Gold medal. The Kiwis reached half-time on a 92-23 lead and used this game as a warm-up before the next stages. Good game from Vailili Malauulu and Ata Perese though. A nice contest between the two american territories, the samoan held on during the first half of the game (29-32) but a most experienced Guam team was able to go off the court as winners. Ata Perese struggled with his shots and recorded a surprising 20pts 9/28FG 25rbs! The samoans finally secured a win to avoid the last seat in this event, thanks to a high-octane offense (57.5%FG), and a no-defense PNG team. Vailili Malauulu celebrated the end of the tournament with a team's high 33pts.